Published 1997. 52 pages, A5, illustrated. 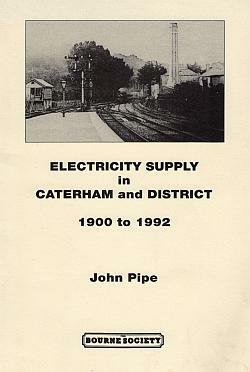 John Pipe details the industrial history of electricity supply in the Caterham area. This illustrated 52-page book published in 1997 has a generous index and much detail, including a glossary of terms and accounts of the importance of reliable electricity supply to the railway network as well as to local businesses and residences. A review of electrical generation at 85 Croydon Road from the purchase of the site and ordering of plant in 1903 until cessation of generation in 1924 and demolition in 1988. In the early years of the electricity supply industry each undertaking needed to provide its own generating plant; the idea of bulk supplies from another undertaking lay some decades ahead and it was not until about 1930 that regional 132kV grid systems came into being and another quarter of a century before the arrival of a 275kV national grid later reinforced by the 400kV super grid. At the turn of the century there were 310 power stations providing public supplies in Great Britain and the number increased to 500 in 1929 before the arrival of regional grid systems led to a continuous decline. Today there are about 120 public supply power stations providing electricity in quantities undreamed of in the days when Caterham Power Station was commissioned in the autumn of 1903. The Croydon Road site having been purchased from Mr Bond in February 19032 work commenced during the following month on the foundations and buildings but not without skirmishes with several members of the Urban Council who contended that the buildings, and especially the chimney, would be an eyesore to the artistic beauty of the neighbourhood. The impression over ninety years later is that the power station aroused much less indignation than the feeder pillar in Station Avenue. The order for the civil engineering and building works including the 100′ high brick chimney was placed with J & L Ward of Warlingham. It is surprising that a local builder had the resources to carry out such a project but it was a well established firm owned by John and Joel Ward the sons of Richard Ward the founder of the firm in 1827. Apart from workshops, stores, mess rooms and offices the power station was formed from five components which were the engine room, boiler house, coal store, battery room and the chimney. The total cost of constructing the station was £8000. Generation appears to have commenced at the end of October 19033 and the station was opened on 25th June 1904 by Mrs Soper the wife of William Garland Soper the chairman of the Caterham Urban District Council. Mr J C Wigham on behalf of the directors of UESCL presented Mrs Soper with a silver switch bearing the inscription ‘Presented to Mrs W Soper on the occasion of the Official Inspection of the Caterham Electricity Works, 25th June 1904-6 The works were open to the public from 4pm to 10pm on Monday 27th June 1904 and at the same time on the Tuesday and Wednesday? The three generating sets were provided by Bellis & Morcom of Birmingham who are still in business and with encouragingly good archives. The page in the manuscript order book recording the contract for the first two machines is a fascinating picture of industrial life in early Edwardian days with orders from South Africa, Australia and for Royal Navy destroyers.